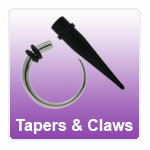 Ear Stretching Expanders - Tapers, Claws and Talons for Stretched Earlobes. Ear stretching expanders in acrylic and steel. Ear stretching jewellery in this section can only be used on fully healed body piercings. Straight and curved ear stretching tapers and claws for making larger holes in your earlobes.